They warm up your chilly office and keep your house guests comfortable all night long. Portable electric heaters give you more control over your own comfort and let you bring heat to where you need it during the cold winter months. Like any appliance, portable electric heaters come in a variety of models and sizes, with different features. We’ve put together a guide to make it easy for you to buy your next portable heater so you can stay warm while you wait for the snow and frost to give way to spring flowers. Panel heaters could be wall-mounted or freestanding, and may include fans. Radiant heaters generate warmth by heating oil within the unit, though the oil doesn’t need to be refilled. Fan heaters distribute heat from an element using a fan. Ceramic heaters use a ceramic heating element and may also use a fan to spread heat. Infrared heaters generate heat from a surface within the heater. The heat is emitted in the form of infrared energy. Will you be using the heater for temporary personal heat or to keep a room steadily warm? The size and type of heater, and the size of the space you’re trying to heat, will be factors. Do you need instant heat, or can the heat be generated gradually? Keeping your feet warm under your desk at work for a few hours will call for a different solution than making sure guests stay warm overnight in a chilly bedroom. What’s your noise tolerance? Any heater with a fan will generate some level of sound. An in-store demonstration will help you decide what’s appropriate. A thermostat to keep the heat at a steady temperature. Some models offer a digital setting. Some types of heaters may employ additional safety features, including automatic shutoff if the heater tips over, cool-touch housing, child locks, or motion sensors that automatically turn the heater off if anything gets too close. Purchase a heater that is safety certified. This means it has been tested by a recognized safety-certification organization. Look for a safety certification mark on the packaging or the heater. Don’t leave your heater unattended and always unplug it when it isn’t being used. Don’t use your heater with a power strip or extension cord. Fire can result if either overheats or if the wiring in the extension cord cannot handle the wattage of the heater. Placing anything on top of the cord, including furniture, could damage the cord. String cords out on top of area rugs and carpeting. Never use a heater with a damaged cord. Combustible materials, including furniture, pillows, bedding, papers clothes and curtains, should be kept at least three feet away from the front of the heater and away from the sides and rear of the heater. Don’t block the heater’s air intake or outlet. Keep flammable materials, such as gas and paint, away from the heater. Don’t use heaters in wet or damp areas unless they’re designed for bathrooms or outdoor use. Heaters not designed for this may be damaged by moisture. Periodically check the plug and outlet for a secure fit. The outlet may need to be replaced if the plug does not fit snugly or if the plug becomes very hot. Consult with a qualified electrician to replace the outlet. Don’t plug any other electrical device into the same outlet or the circuit as the heater. It could result in overheating. Keep children away from heaters and do not place one in a child’s room without supervision. 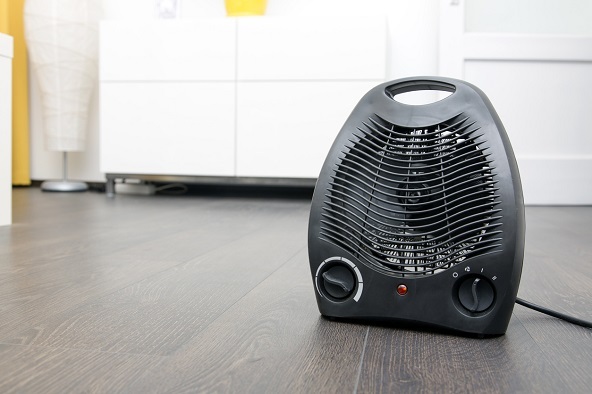 Heaters should be put on a flat, level surface. Only use a heater on table tops when specified by the manufacturer. Do not place the heater on furniture. It could fall, resulting in damaged or dislodged parts.